Laws around criminalized substances and substance use vary not only from country to country but also, in the United States, from state to state, particularly those laws pertaining to marijuana. Enforcement can vary even more from county to county, township to township, and even individual to individual. This variation is perhaps most apparent when working with pregnant and postpartum women. Throughout the country, women who are pregnant and have tested positive for a substance face varying consequences. Some may be arrested, while others will meet with a social worker from Children and Family Services immediately following delivery. The latter undergo investigation and receive services such as referrals to treatment, for example. 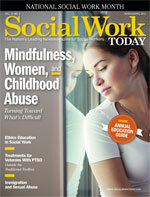 For social workers, these women and their families can be challenging cases. The policies and limited resources as well as the client’s resistance and needs create a complex foundation for service. With no consistency in testing rules, it’s no surprise that subsequent actions are equally as varied. The most extreme responses occur in South Carolina and Alabama, where the women can be arrested, Paltrow explains, citing the state’s child endangerment laws. “The Alabama Supreme Court decided that the word ‘child’ extends to fertilized egg,” she says. In other states and counties, the interventions are less severe. Take Philadelphia, for example. “When a woman tests positive for substance use during pregnancy in Philadelphia, the Department of Human Services [DHS] is notified. After she gives birth, the hospital is required to contact DHS to report the substance use, even if both mother and newborn test negative for substances at that time,” says Christine Edinger, LSW, director of DHS contracts for the Health Federation of Philadelphia. “If this is the first instance of substance use during pregnancy for the mother, then her case is sent to the DHS Child Abuse Prevention and Treatment Act [CAPTA]. She is then assigned a CAPTA worker and an assessment is completed,” Edinger continues. For those who tested positive in a previous pregnancy, an intake worker is assigned, and an investigation is completed, she adds. Depending on the outcome of the assessment or investigation, the woman may then be referred to community services provided by the Health Federation of Philadelphia. The process is similar in Nebraska. “If a baby is born with a positive drug screen, it’s an automatic call to Child Protective Services,” says Heather Bird, LICSW, LADC, MPA, program director for the Nebraska Family Works Program and Better Together, both in Omaha. All policies focusing on pregnant and postpartum women refer to all substances. How the legalization of marijuana and the use of medical marijuana in several states affects said policies continues to unfold. The services offered and/or provided to the mother and the family following a positive drug screen and the birth of the child vary as well. From the testing through the treatment and services described, there has been little differentiation in the substances in question. And the same is true of the challenges social workers will face. Obstacles when providing substance use–based treatment are universal from the lack of programs (Bird’s program is the only of its kind in Omaha, a city of more than 400,000 people, and can serve only 10 families at a time) to the universal yet sometimes case-specific policies enforced, as Paltrow says. However, there are some unique aspects to one substance in particular: marijuana. Now recreationally legal in three states and seemingly en route to being approved for medical use in many more, marijuana remains a federally criminalized substance. Women who test positive for the substance during pregnancy are subject to the same consequences as those who test positive for any other substance. But the mixed messages surrounding the drug can prove difficult. Resistance also can come from family members who balk at the idea of their relative attending treatment for marijuana use, Edinger adds. “Additionally, it can be more of a challenge for a woman who smokes marijuana to access treatment,” she notes. This is even more noteworthy when taking into account the amount of women in these programs who use or have used marijuana. “I would say that 85% of the women in our program test positive for marijuana. Some are strictly marijuana users, and others are polysubstance users,” Edinger says. Bird says her program has worked with a few mothers who strictly use marijuana. However, more often than not, the mother is using marijuana as well as another substance, such as methamphetamines. No matter the substance, overcoming resistance to substance abuse treatment takes great and meaningful effort on the social worker’s part. “We need to create an environment in which people who have drug-dependency problems can receive help,” Paltrow says. “They’re not just using; they are people who really have problematic drug use and they want help. There is no state in this country that has enough treatment for all the people who need treatment.” She adds that the treatment should appropriately address not just substance use but trauma, lack of resources, and related concerns. And above all, Paltrow, Edinger, and Bird agree that it’s necessary to meet the client where she is. — Sue Coyle, MSW, is a freelance writer and a family case coordinator for the Health Federation of Philadelphia.